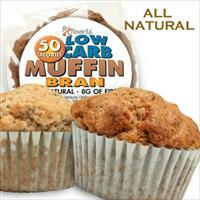 Ingredients: water, erythritol, oat fiber, inulin, egg whites, modified corn starch, almond meal, olive oil, xanthan gum, guar gum, leavening (monocalcium phosphate, baking soda), natural flavors, blueberry skins. Contains almonds and eggs. Baked in a dedicated gluten free facility that uses peanuts, tree nuts, and dairy.